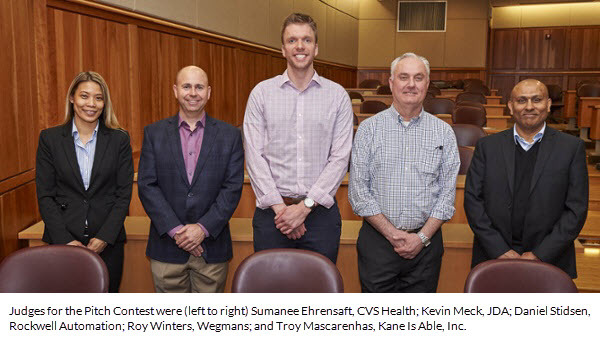 Kane Is Able was among the companies that sponsored the recent Penn State University Supply Chain Entrepreneur Pitch Contest, which saw teams of students develop ideas for new business ventures in the supply chain space. Students presented these ideas to a panel of supply chain experts in the style of the Shark Tank TV series. KANE's CFO, Troy Mascarenhas, served on the panel of "sharks" (sorry, judges) that evaluated each prospective business in terms of its viability as a supply chain management product or service. According to KANE's Senior Director of Marketing, Alex Stark, "This Penn State project addresses two key issues in the logistics industry: Innovation and the development of young talent. We are happy to be involved, both as a participant and a financial sponsor. " The supply chain pitch contest was put on by Penn State's Smeal College of Business.